The nightmare of the Las Vegas massacre, which left 58 dead (Updated 10/2/17 to 59), 527 injured, and impacted hundreds of thousands lasted for minutes, but the recovery process will be long. After a human-caused tragedy Stars of HOPE responds immediately with a positive shock to remind families, survivors, community members, first responders, and local officials that “Love is Stronger Than Hate”. We will be part of the long, long-term recovery of Las Vegas, and you can too. The unique approach behind Stars of HOPE is that we took a simple art project and turned it into a public art display in a disaster zone. This allows us to give inspiration and emotional support to thousands of disaster survivors within devastated communities who see these messages of encouragement and compassion throughout the long-term recovery phase of disasters. Often Stars of HOPE become a survivors lasting inspiration to remember there is still love and kindness in the world. Your Star of HOPE makes the impact someone needs. 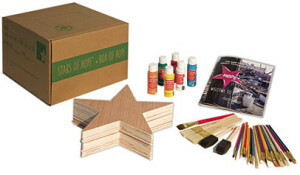 Click here to order your Stars of HOPE Box of HOPE to support Las Vegas. Where do I send my Stars of HOPE after I have painted them for Las Vegas? UPDATE: Stars of HOPE volunteers from Orlando and San Bernardino responds 4 days later delivering messages of HOPE from families and survivors.